HIGH QUALITY MDF PANELS- Manufactured in the UK, our MDF panels are 18 mm thick with a melamine-faced finish. SLATS WITH 100 MM CENTRES - Standard measurements ensure compatibility with most existing slatwall panels and accessories. SPACE-SAVING AND VERSATILE DISPLAY- A popular and cost-effective way to transform any retail display by maximising available wall space. 1/2 GROOVES AT THE TOP AND BOTTOM - Allows you to join panels together and continue the run of slats. 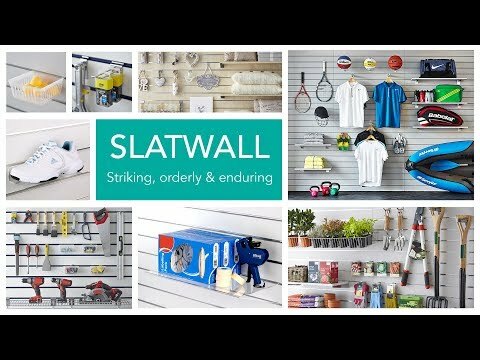 WIDE RANGE OF ACCESSORIES - We stock a variety of hooks, arms and shelves to create a unique display. Click here to see the coordinated range to fit with these panels and inserts. Delivery This is a large heavy item that must be delivered on a pallet or double pallet. A forklift truck or able people will be required to unload the item from the delivery vehicle. Click ‘Delivery’ for more details.